By joining the Blogger’s Pit Stop, you signify permission to share your posts and images here and on social media. Entering your email address on the Linky indicates permission to send you an email reminder when our next rally is LIVE. 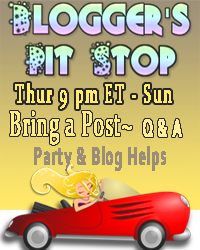 We are excited that you joined the Blogger’s Pit Stop #166.